Thoughts on the Focusrite VRM box…..
Focusrite VRM Box: What EXACTLY does it do? First, I own one of these. Third, Its a fairly simple idea, that gets lost in translation. In the old days of home studio recording, you would run happily between Hi-Fi, Car stereo, Beat box etc playing your brand new mix, trying to see if it sounded equally good on all. The idea being of course, that ideally the mix would sound brilliant on everything. The reality was somewhat different. Each system you played it on brought its own colour and eq to the party, and you invariably ended up more confused than when you started. So to the Focusrite VRM box. A virtual way of doing the same thing, without leaving the studio. The Focusrite VRM box simulates the sound of your mix, as it would be heard through 13 different types of reference monitor, including Japanese White Classic (an NS-10 algorithm), KRK Rokit6 and VXT8 models, Auratone, American Passive, British Studio, Genelec 1031A, plus Adam S2.5A and Rogers and Stirling LS3-5A monitors and in a choice of 3 different rooms, bedroom, living room, studio control room. Only thats not just it. You see, its REEALLY useful….. Lets try and understand exactly why. First off, the whole idea of mixing / mastering is hugely subjective. Thats the reason there are so many different types of reference monitors on the market. Some people just prefer the sound of one to another. I personally still rely on an old original pair of Mackie HR824’s. I know I’d love a pair of Adam A77x’s, but I dont need them, my stuff is broadcast on TV, Radio and in Cinemas, It’s mixed in my basement studio. 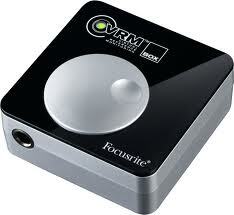 So what is the use of the Focusrite VRM box…… ? It will never hurt for you to hear your track in different circumstances. Just the lifting of a Bass section can show how well or not it works with aa Keyboard part, just aboost to a string line can reveal clashes that didnt seem apparent before…. Take a well mastered album or song you know well… I mean REALLY well. Play it through your headphones using the Focusrite VRM box, and pick a room setting and 3 speaker settings. Listen to what it does to the reference track. First of all this is fun. It brings out all sorts of things you’re not used to hearing, and that’s a good thing. Does the reference track lose or gain anything when listening to the familiar track? Now play your own mix. Listen to how it compares. If the same Focusrite VRM settings are having the same sort of effect on your mix, you can be reasonably sure you’re in pretty good shape. If however, the different speaker settings are giving wildly different results, you may need to start moulding your finished mix to suit. To recap, if you play a properly mastered album through the Focusrite VRM box settings, you should still be able to hear all the constituent parts, albeit some may be louder or quieter than you expect. If your track starts to lose bass lines or you develop a hump in the mid range, it may be time to look at a different set of reference monitors. Alesis @ NAMM with iPad tools and controllers aplenty. Previous PostPioneer Announce The XDJ AERO The First Wi-Fi Dj Control Surface.Next PostCompressors: What does what?